It's getting close to winter ... and therefore just a bit on the cool side, weather-wise! When that happens in the vicinity of the Cheap and Sleazy Labs, you know what that means ... yes, that's right: Chili! Just to be clear: I'm not talking about any ol' canned chili with (zzzzz ....) ground beef. No, I'm talking about chili you make yourself ... with STEAK. The good news is this recipe is easy enough such that even a guy who's expertise in the kitchen consists of microwave buritos, microwave TV dinners and microwave popcorn can do it! If you're not hungry after reading this article, you must've just ate! "Baby, it's Cold Outside ..."
Yes, it's fall ... getting closer to winter. If you live in the Pacific North Wet as I do, you know that fall means more rain ... except this time of year, it begins to get cold ... and sometimes, downright mean! I'm talkin' about the "slap-you-in-the-face-with-hail" kind of mean! If you've ever been caught outside in the rain when you were a kid, did your mom ever greet you with a steaming cup of hot soup or something when you came home? No? Well, me neither ... but it sure looked nice on those commercials! If you're living alone (or worse, you're living with one of those guys (or gals) whose cooking (mis) adventures usually involve frozen TV dinners and microwave burritos (sorry about that, Lady J! )), I have just the thing to get you that "warm you up inside" feeling you may have seen once on TV when you were a kid (those of you under 20 are exempt!). Alas, you'll have to do your own cooking ... but trust me: It'll be worth it! Add a bottle of liquid smoke (~$2.00) to your shopping list! I'll tell you why ... later! As for how much all this costs (including the missing Chipotles): $1.00 each for the black beans, kidney beans and the tomatoes, $.79 for the corn, $1.85 for the chili seasonings, $1.99 for the chipotle peppers in adobo sauce, and (wait for it ...) $3.06 for the steak ... which adds up to $10.69. All told, everything on this list (less the crock pot, of course) should run you about $12.00, max. Shop wisely, and you might be able to get it down to $10.00 ... or less! Even better, once you buy that first can of chipotle peppers, since you only need one (you do have an empty jar to store those peppers in, right? 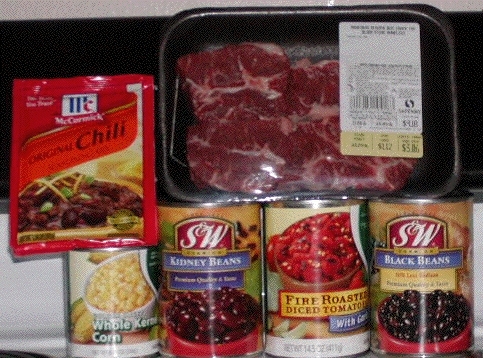 ), you can chop off that $2.00 next time you need to make chili ... so technically, all the ingredients I bought actually cost $8.70! "Yeah, but I just bought a can of chili for $1.00 ... I think I came out way ahead!" Yes, you did ...! But for one person, my recipe will last about four days. Your can of chili will be gone long before then. Say, did I mention that I use steak in this recipe ...? Did your can of chili come with steak, or just ground beef? Thus far, I have only used the Embasa brand ... but I note that there doesn't appear to be a lot of the adobo sauce in it! 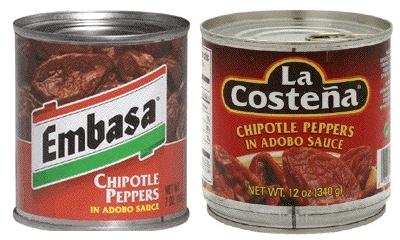 In fact, if you pick up the two cans and shake them back and forth a bit (as I did during my big shopping expedition in prepping for this article), one (La Costeña) seems to slosh a bit more than the other (Embasa) ... so next time, I plan on buying the La Costeña brand. I bought a can of the La Costeña brand recently, and mixed the contents with the remainder of my Embasa chipotle peppers in an empty jelly salsa jar that I saved just for that purpose (well, not just for that purpose, but ... well, you know what I mean). When it came time to make another batch of chili, I was more easily able to get that spoonful of Adobo sauce, which resulted in a batch of chili that had just the right hint of chipotle-instilled smokey taste and a slight bit of fire ...! In short, buy the La Costeña brand! 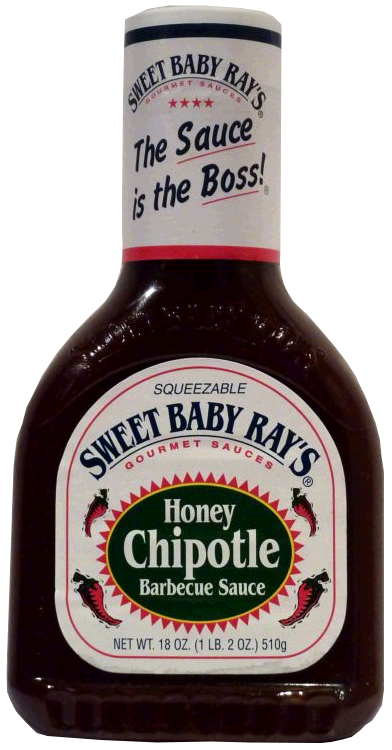 In re-reading that bit about the chipotle peppers, I realized that I had actually mixed two different brands together ... so next time out, it might be good to give that a try. Fair warning ... chipotle peppers are basically jalepeño peppers in their ripe form -- when the young green jalepeño peppers turn red, they are then dried and smoked, giving them a sort of smoky flavor (take a whiff when you open the can!). This recipe calls for you to take JUST ONE of the peppers in the (non-resealable; what's up with that?!) can, cut it into small pieces, and dump it into your crock pot. Because in one of the two recipes I used to create this recipe, the author told a sad tale of a friend who misread the instructions and used THE WHOLE CAN in her chili! As you might guess, her chili was too hot for anyone to eat ... but, when mixed in with four other pots full of chili, the temperature (eventually) came down to a tolerable level ... so, consider that tale your warning!! ONE chiptole pepper per pot of chili!!!! Sorry to yell ... but hopefully you won't replicate that tale of woe! First, score the meat before cooking ... and in keeping with the teachings of the authors of Cheater BBQ, toss your steak into a pot, and pour some liquid smoke in there -- ideally, enough to cover the meat, or at least half of the meat. You're going to soak -- er, marinade it for an hour or so. If you don't have a dedicated rice cooker, use these instructions to make rice in your crock pot. One cup of rice should take about 90 minutes to cook, and you can use that time to marinate your steak in the liquid smoke! Trust me, it will be worth it! Just make sure if the meat isn't completely covered that you turn it over after 45 minutes. Once the rice is done, put it into another container (you're going to need the crock pot for the chili, right?) and put the meat on the stove and turn the heat up to medium. This step should take about five minutes. Once the meat is pretty much done, turn off the heat and transfer the meat to a plate, and cut the steak into small, bite-sized pieces. For those of you who are not living alone, this stage can be problematic: Your roomie will smell the steak cooking, and will WANT SOME ...!! Fight them off by showing them that the meat isn't done. Usually, that does the trick ... but the more persistent ones will insist that you cook the meat longer! Ignore your roomie, and toss that steak into the crock pot at the appropriate time. If you have dogs, they will become your new best friends during this stage, but ignore those begging eyes (if you can) ... but they'll love you if you give them a piece of the meat ... later. Also, as you are just browning the meat, when you're done, it should probably be a bit on the rare (say "raw") side ... so, while tempting, DON'T EAT IT! While the steak is cooking, open your can of whoopass Chipotle Chili Peppers in Adobo Sauce, grab one of those peppers, and cut it into small pieces ... then get a teaspoon of the Adobo sauce, and toss them both into the crock pot. You can also use this time to drain your beans. I just open the cans, leaving the lids on, and let cold water run into the can -- at a pressure that doesn't cost you any beans, of course! While that's happening, it's time to dump your seasonings into the crock pot (see the 18JAN10 update, below). Ensure you sprinkle the seasonings up and down the length of the bottom of the crock pot -- that is, you want to try to cover the bottom with the seasonings (you won't succeed, but that's what you're shooting for). By this time, the steak should be done, so go ahead and cut that steak into bite-size chunks, and toss them AND the leftover liquid smoke into your crock pot. Now (optional, remember ...!) open that can of corn or peas, and toss that into the pot; you can drain it if you wish. BUT, if you have kids or live with people who think Red Hot candies are too hot and aren't too happy with spicy foods, adding that sweet juice from the corn or peas might make it more tolerable for those whiners them. Next, open your can of tomatoes. If they're whole, cut them into bite-sized chunks, and pour them along with the juice, into the crock pot. After doing some research, I found mention of a chili powder called "Chile Ancho Powder." It took a while, but I finally found some at my local Central Market store. I bought a three ounce packet. If you use this instead of the chili seasonings listed in the ingredients, use one to three tablespoons of this powder (I stick with one, because three made for a really hot chili, which did not go over well at one of my school's potlucks! The second batch (a few months later) was much more appreciated ... and less hot!). You'll need a spice jar to keep the chili powder in, because the Chile Ancho Powder comes in a plastic bag that doesn't re-seal! Add in that 1/4 teaspoon of baking soda, then stir the whole mess around. Update (18MAR11): The O.M.G. Variation!! As you might guess, I have been trying to get the meat to be as flavorful as I can get it; that's the idea of the liquid smoke. 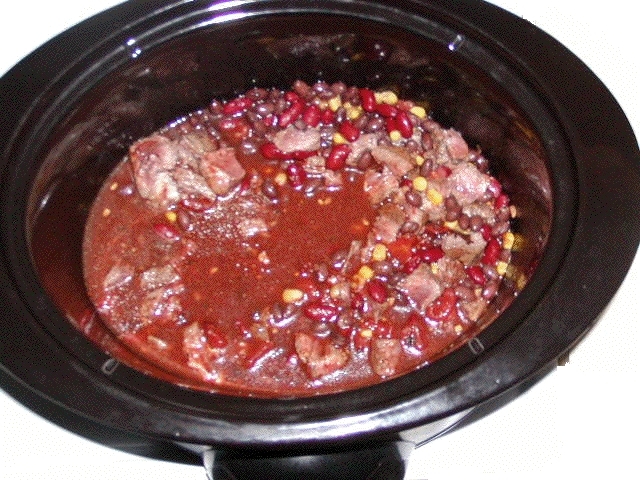 -- and then adding the meat (pre-cut stew meat, in this instance), raw, and just cooking the meat for an hour on low ... and then I add the rest of the ingredients (the beans, corn or peas). I have also taken to just leaving it on Keep Warm for eight hours to further tenderize the meat! If you can keep your roomies from helping themselves, you will end up with a very flavorful batch of chili ... not to mention how your house will smell during that extra 8 hours. Now, the hard part: Set your crock pot's timer for four hours on low ... and go Elsewhere. I recently tried making this recipe from memory, and inadvertantly put the crock pot on high instead of low ... and didn't realize my error until an hour or so later -- and I wasn't at home! Amazingly, it came out perfectly. Did I tell you this recipe was easy, or what?!? A couple days ago, I stopped by one of the Pacific North Wet's own restaurants, Taco Time, in search of something called, "The Chipotle Barbecue Beef Burrito," which they used to make a few years back, and no more since, unfortunately. Alas, I was unsuccessful with that visit, but that didn't stop me from buying something else instead! "Dude. Why not Google "barbecue chipotle" ...? So, a quick Google search later got me this recipe ... which, if you take a look at it, requires twice the amount of steak I usually use, so I had to do some modifying ... and by that, I mean I had to use exactly half of the ingredients shown in the recipe. For the mathphobes out there -- and the folks that aren't fortunate enough to have one of those refrigerator magnets that tell you what's what with the various measurements, as I do -- that quarter cup of chipotle peppers in adobo sauce became four tablespoons, and ... well. Let's just say that I'm probably making my downstairs neighbors very hungry right now! 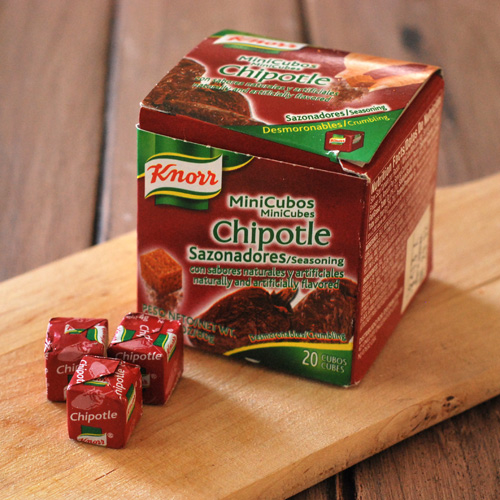 Basically, those are chipotle flavored cubes with a few other things in it. You should be able to find these at your friendly neighborhood Walmart, but of late, I have been having trouble finding them there, and trying to describe them to the hapless associate trying to help me was ... difficult, at best, so now I just buy them straight from Amazon. ... and yes, you can buy just one, which is good if you find that you're not a fan, as I am these days. Oops ... I Appear To Have Forgotten Something This Time Out! Yes, that's right ... during my rush to try that barbecue chipotle recipe, I completely forgot to add chili powder! Ah, well. There's always next month's batch. Hopefully, I'll remember to share with you one of the recipes I found for chili powder in that "Cheater Barbecue" book I may or may not have mentioned earlier. As I mentioned up there, I bought a copy of "Cheater Barbecue," and while looking for something else in that book, I found a recipe for chili powder! A (mildly interesting) true fact for you: many of the recipes I found for chili powder in other books required the reader to have ... chili powder. I mean, if I had chili powder, I wouldn't need your recipe, right? Sheesh! Place all of those ingredients in a jar, as you're not going to use all of it, and shake it up (baby). I usually do this when I have opened the steak, and season the steak right there in the package with one or two tablespoons of the mix of spices. After a few minutes, place the steak into your crock pot, seasoned side down, and season the exposed side. 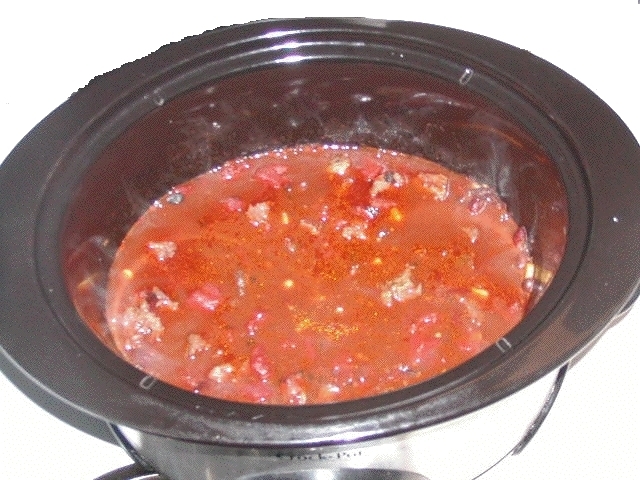 Place the lid on your crock pot, and cook it on low for a couple hours. If it looks fully cooked, I usually take the steak out of the crock pot and place it on a dinner plate, and cut it into bite-sized pieces, then cook it again for another couple of hours. By that time, the steak should be ready ... but before you add in those beans and etc., this would be the perfect point to add in your favorite barbecue sauce (I used one cup, if I recall correctly ... just enough to cover the meat). Again, cook it on low for a couple hours, at which point you would add the veggies, and cook on low for another four hours or so. Chances are good your neighbors are going to be getting hungry, thanks to your efforts! Feel free to point them to Cheap and Sleazy for the recipe. "Dude -- What's With the Baking Soda?" A good question ...! Let's just say it cuts down on certain noxious bodily emissions, and leave it at that, okay? If you followed these simple directions correctly, it is time for you to enjoy the fruits (veggies?) of your labors, and try the chili! If it's hot enough to burn your tongue off, you may have went overboard on the chipotle peppers or the chili powder! If it isn't too hot, you should be left with a chili with a smoky flavor (thanks to the liquid smoke you cooked the steak in as well as the adobo sauce) that will make your dogs drool! :o) Know that it would be considered cruel and unusual punihment not to share a bit with your furry friend, so give your canine companion a piece (or two) of that steak! They'll love you all the more! Even pouring a bit of the juice from the chilli into their dry dogfood will turn that boring ol' dogfood into something they'll eat very quickly! Not sure why, but I enjoy a little Jasmine rice with my chili! That link takes you to the directions to make rice ... in your crock pot! Coffee mug? No ... Chili Mug! When I can, I will update this article on how to use dry beans, your own spices, ground by a mortar and pistel! Cooking beans you buy in bulk or in a plastic bag in a crock pot is a skill worth learning to do ... and making your own chili powder is as well! Look for that addition in the not-too-distant as a separate article (which will be linked here).